Last Christmas, while trying to find educational games that my daughter would enjoy, I was looking for materials with a strong female character to inspire her and hold her attention. At some point I had already seen this deck advertised and had bookmarked it for future examination. But I hadn't really read what it was about. Imagine my delight to discover that this set of mini-mystery cards features 13-year-old, Isabella Tia Marie Martinez...otherwise known as "Bella." Together with her faithful black Labrador retriever, Noche, she unravels mysteries around her town. This deck has 50 cards, each one with a short story. 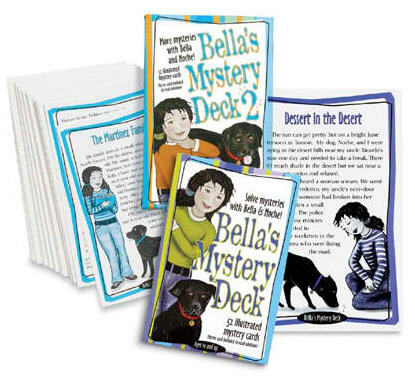 Embedded within the stories are clues, that your child must uncover to solve each mystery. And if you get stuck? No problem. The answer is written in mirror image on the back of each card. A mirror card is included to help you read the answer. We love this product so much! Spanish words and culture are scattered throughout the stories, which have a Latino theme and reflect the lifestyle of Hispanics in the United States. For instance, there are two cards that tell the background of Bella and Noche. On Bella's card, we learned that she lives in South Tucson with her family. Our bilingual heroine is a chicana - her dad was born in Minnesota where his family harvested sugar beets, and her mother was born in Nogales, Mexico. And Bella has a younger brother, Antonio, and sister, Alejandra. Her dad now works for a landscape contractor, and her mother is an artist who makes masks. My favorite line? "You could say that we're a normal family and I'm an ordinary girl - except that I solve mysteries." So far, we have been going through the initial deck, but we're happy to know that there is a Bella's Mystery Deck 2 with a whole new set of stories. These cards are perfect for children ages 8 to 12. My daughter, who is just shy of 8 finds the mysteries a wee bit too hard, but she loves them anyway. I usually help guide her to the solution with specific questions. Teachers could use these decks as a reward at the end of class/week. Parents can use these cards to help their children practice their reading and critical thinking skills. You can find both new and used decks available for purchase in La Librería. Disclosure: I purchased this set online for my daughter. I was not contacted in any way by the company, Mindware, to review this product. All opinions expressed here are my own.